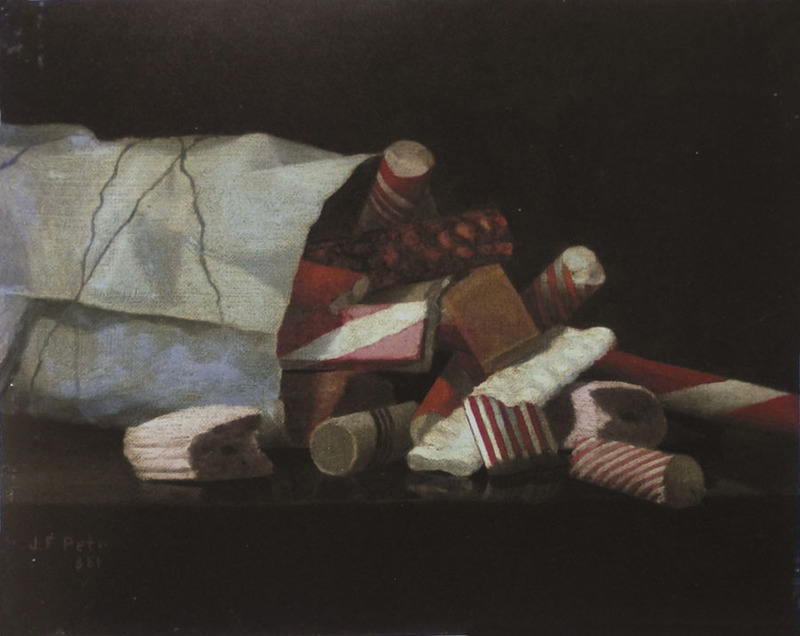 John Peto, Help Yourself, 1881; oil on canvas, 8 1/16 x 10 1/16 in. How better to ring in the New Year than with images of sweets, signs of delicious delight? I wish that you all can help yourself to the good things in life. 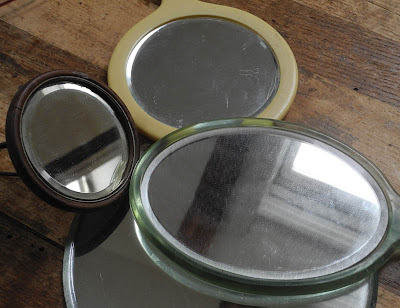 Peto shows us that beauty and wonder can come in a small, ordinary, simple package. 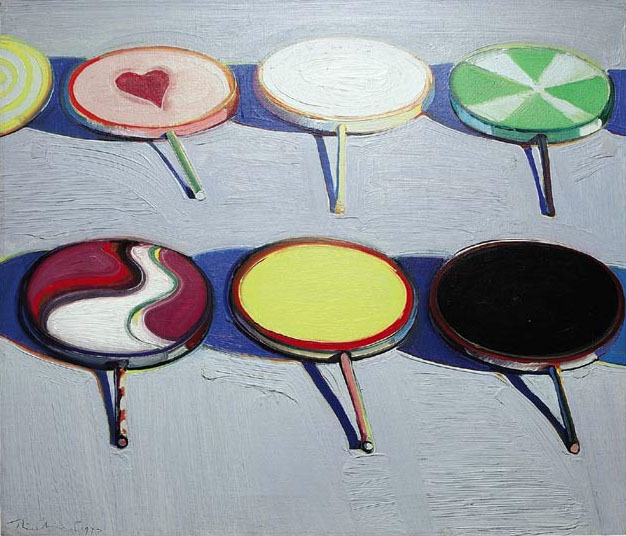 Wayne Thiebaud, Seven Suckers, 1970; oil on canvas, 19 x 23 in. One of the great painters of desserts brings us yummy suckers, the luscious paint as juicy as the candy. 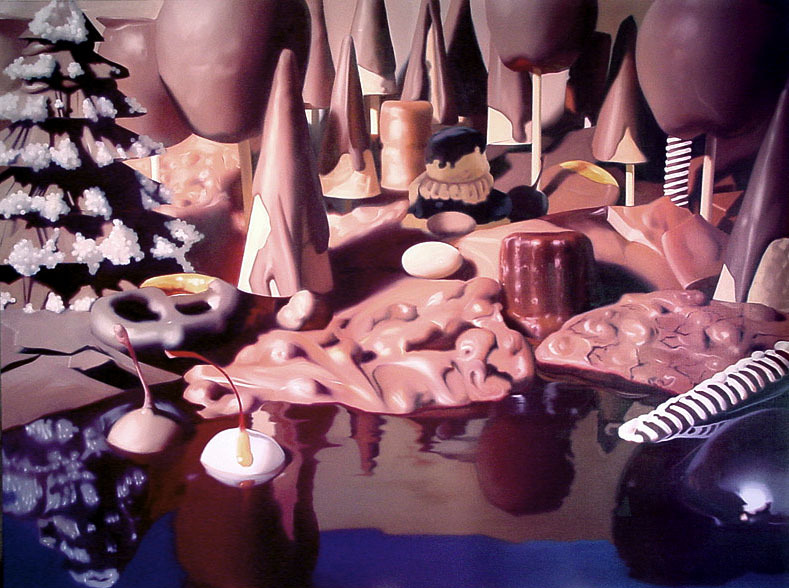 Will Cotton, Chocolate Forest, 2001; oil on linen, 75 x100 in. For my chocolate loving friends, here is a huge painting (imagine standing in front of this bigger than 6 foot high by 8 foot wide canvas!) of chocolate lawn, lake, and trees: heaven for some. 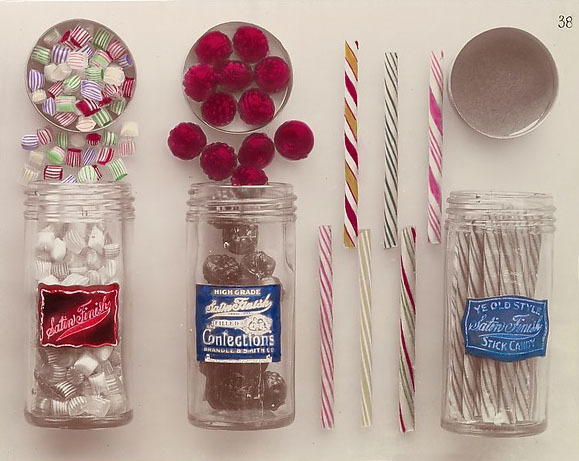 Photography Studio: Schadde Brothers, Satinettes, Filled Confections, and Ye Old Style Stick Candy, ca. 1915; gelatin silver print, 8 1/2 x 10 5/8 in. I enjoy going to the Met's website where you can search their collections. When I put "candy" in the search bar, several photos by this studio came up. They reminded me of my childhood, when you could go into a store and buy penny candy. Box, Britain, early 19th century; enamel on copper, 1 5/8 x 1 1/2 in. Image courtesy of Metropolitan Museum of Art. This charming little box held sweets. 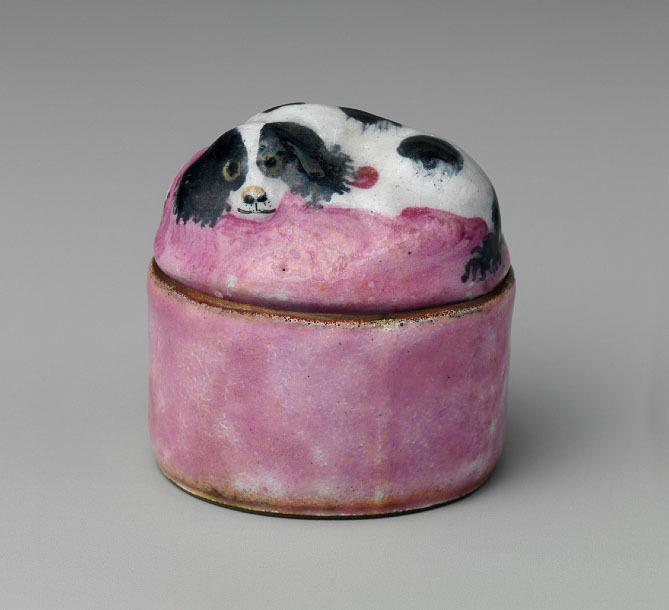 Boxes such as this were popular gifts in 18th century England. I offer you only its image as a New Year's gift. 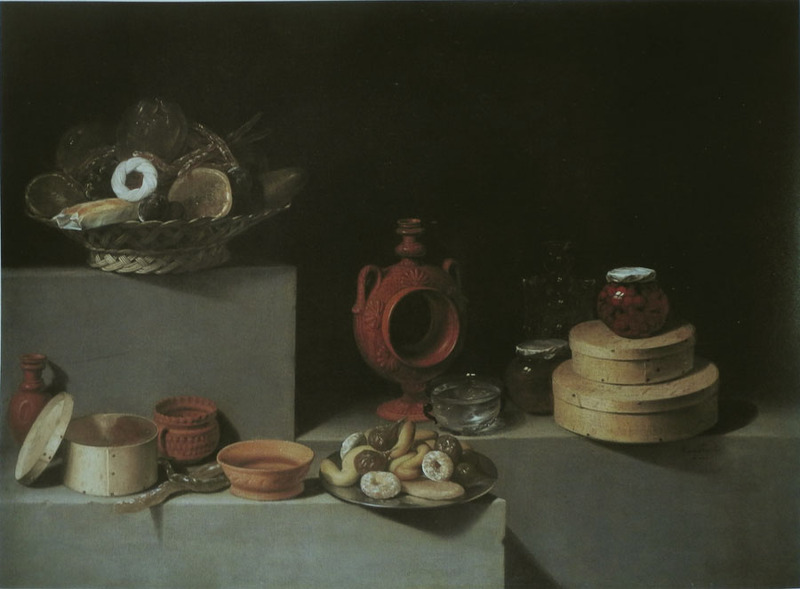 Juan Van der Hamen, Still Life with Sweets and Pottery, 1627; oil on canvas, 32 1/4 x 48 13/16 in. In 17th century Spain, the boxes holding sweets were of wood, and glass jars held moist confections. Like a table spread with delicious treats, may the new year bring you joy. 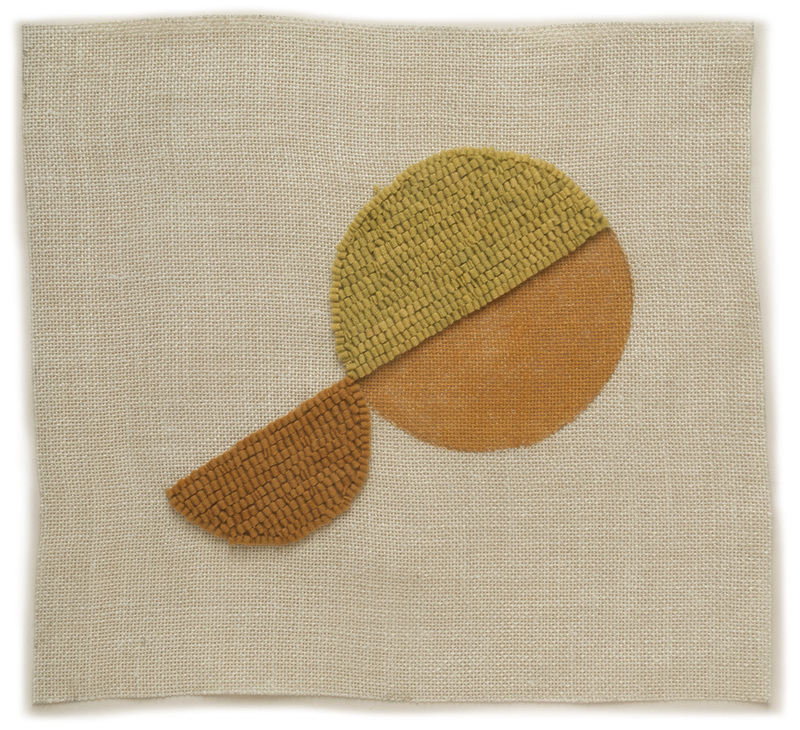 2014 #17, hand dyed wool and egg tempera on linen, 15 1/2 x 16 1/2 in. 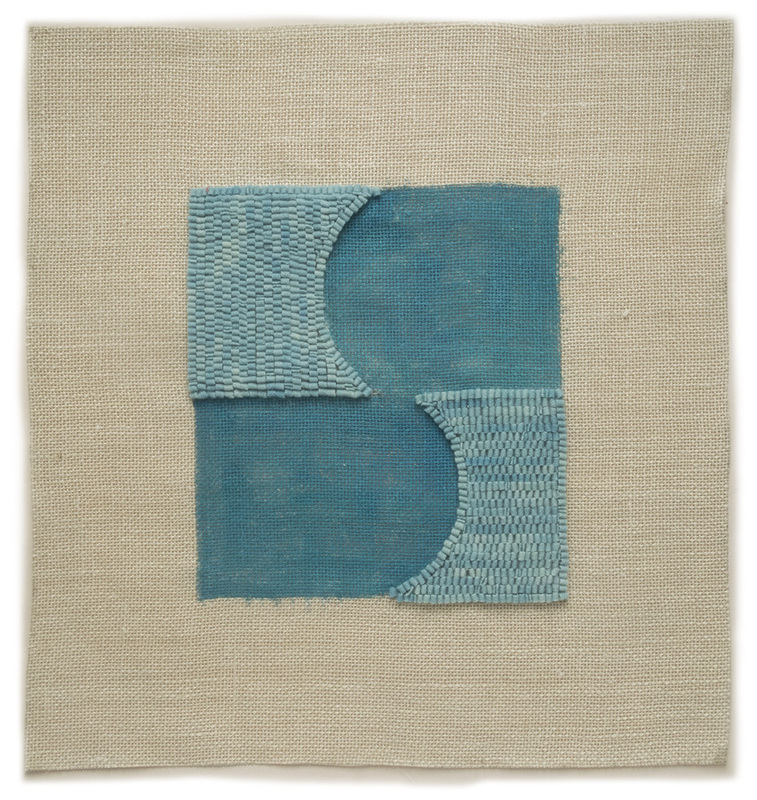 2014 #18, hand dyed wool and egg tempera on linen, 17 x 15 in. .....and a circle rests (rolling?) on a line. 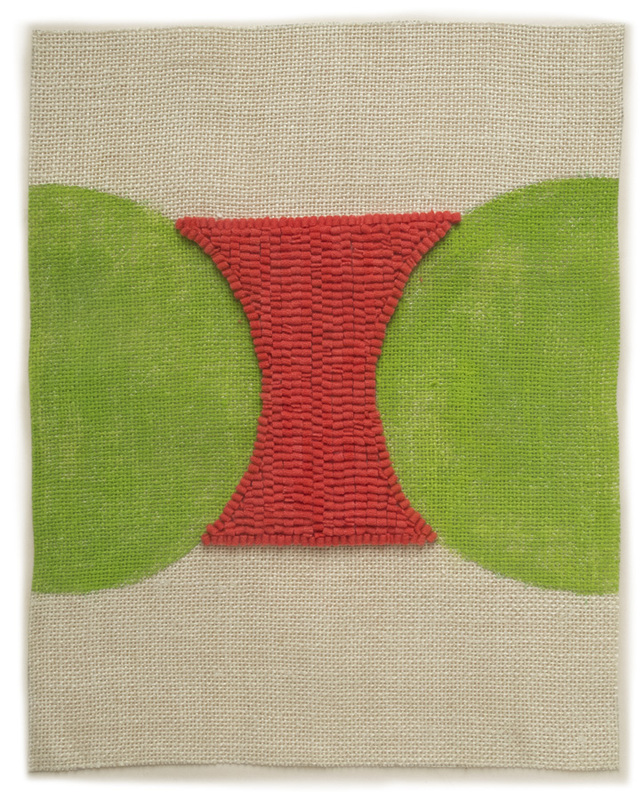 2014 #19, hand dyed wool and egg tempera on linen, 18 x 17 in. Ovals push outward, with positive and negative spaces flipped. 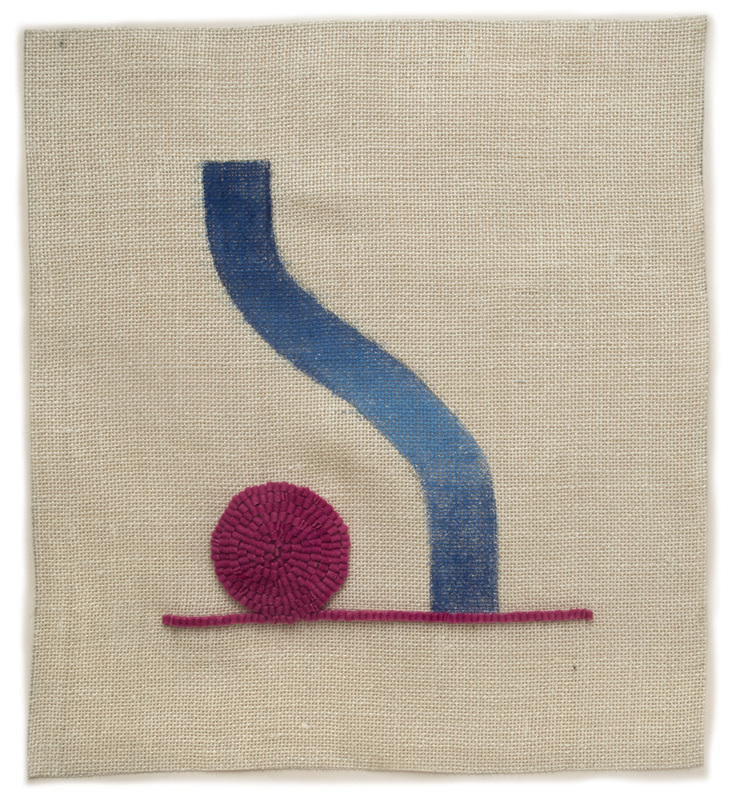 2014 #20, hand dyed wool and egg tempera on linen, 15 x 12 in. 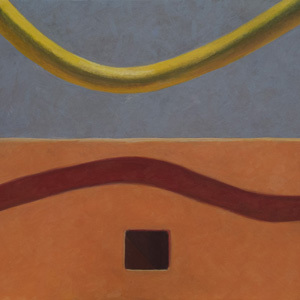 In #20, as in #19, the space between has the weight of hooked wool, and the shapes––"racetrack" (oval with straight lines, and partial circles––are thin paint. Is there something a little uncomfortable with this reversal? I'm not sure. Oh, how I love the Metropolitan Museum of Art! I've wandered the galleries there for years, but there is always something new to discover. A couple of years ago I went down a staircase from the Medieval galleries and found the Antonio Ratti Textile Center which was then showing very beautiful European lace. On my most recent trip, walking up a staircase at the end of the Chinese collection, I discovered 4 small galleries––#s 219 - 222––on the 3rd floor, dedicated to Chinese Decorative Arts. My favorite show tucked away up there was Sumptuous: East Asian Lacquer, 14th - 20th Century (though I didn't see anything from the 20th century). You can see all 44 pieces in the show at the link. There is such wonder in fine objects such as these, in their creativity of pattern and image, and in their inventive and complex process. These gorgeous patterns are carved into lacquer that was layered on wood. The lacquer comes from the sap of the lacquer tree, which hardens when exposed to oxygen and humidity (this information from a wall label at the show). The red lacquer is colored with cinnabar, the black with carbon. Box with Dragons Amid Clouds, China, late 13th-early 14th century; carved black, red, and yellow lacquer. As many as 200 layers of laquer are laid down on the wood surface, though the number is usually around 30; each layer is allowed to dry completely before the next one is added. 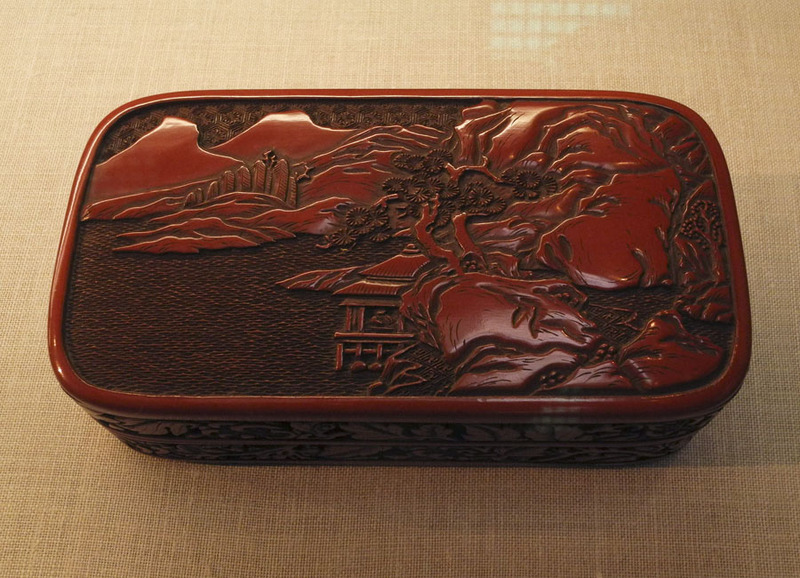 Box with Landscape and Scroll Pattern, Japan, Edo period (1615-1868); carved red lacquer. 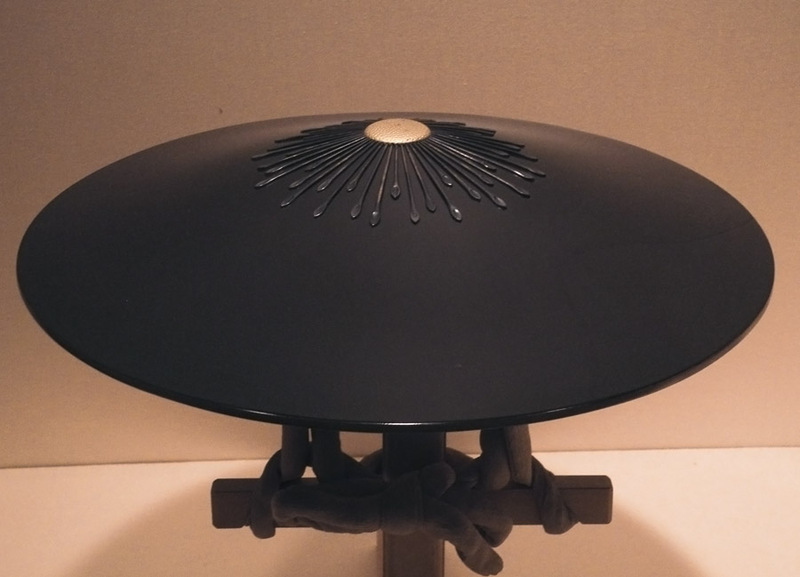 Carved lacquer began in China; the technique was also used in Japan. The carving allowed for beautiful relief effects, much like "fine art" sculpture. 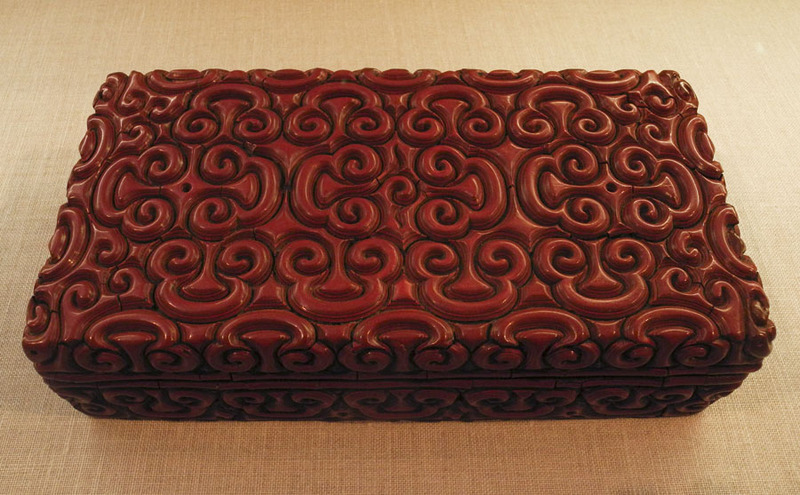 My favorite pieces are the two red dramatically carved Chinese boxes with their overall patterns. 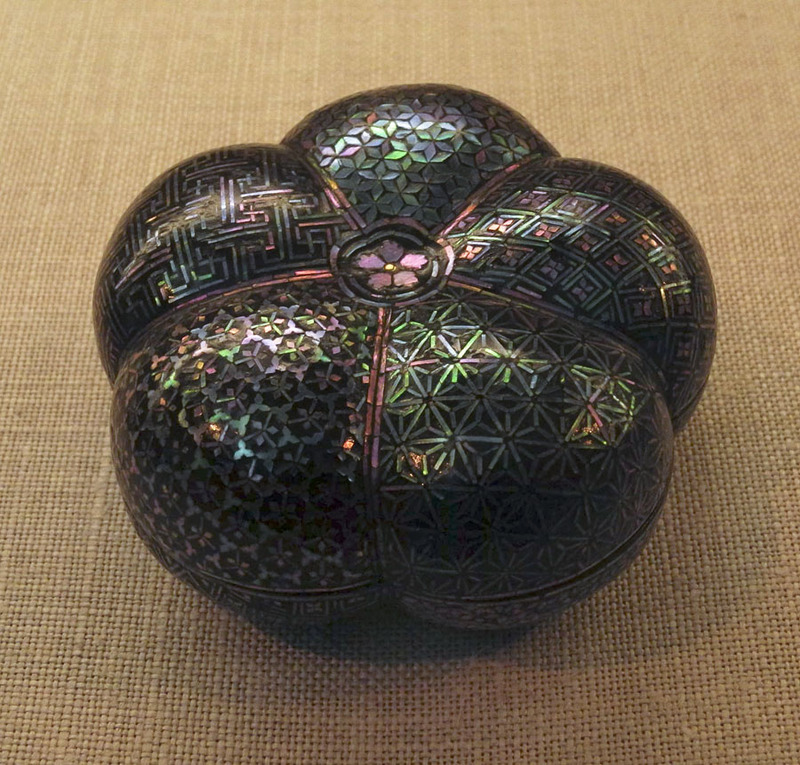 Box with Geometric Designs, China, late 17th century; black lacquer with mother-of-pearl inlay. Another spectacular technique in lacquerware is using mother-of-pearl inlays. The mother-of-pearl, some of which was tinted on the back to give it some color, sparkles against the rich black of the lacquer. This piece is especially fine, with its tiny patterning; I can hardly imagine the patience and precision that was required to make it. 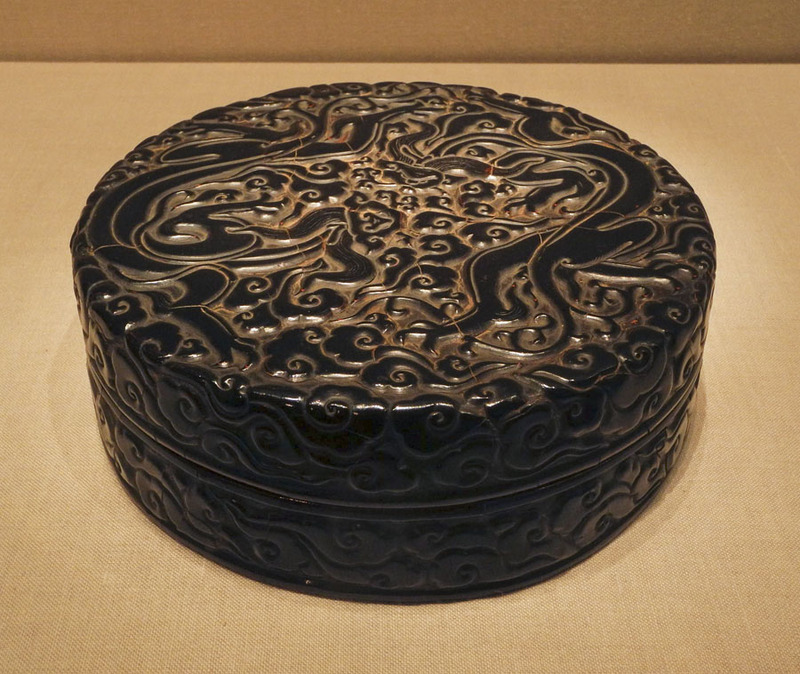 Box with Peony Scrolls, Korea, 15th-16th century; black lacquer with mother-of-pearl inlay. A swirlingly lovely pattern of flowers, leaves, and branches. 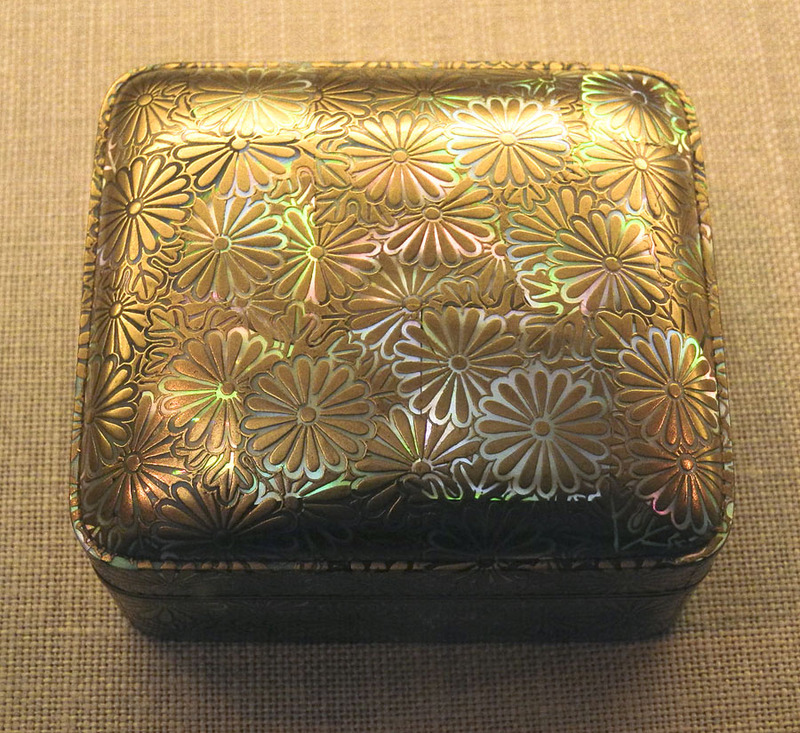 Incense Box with Chrysanthemums, Japan, second half of 19th century; gold hiramaki-e on mother-of-pearl ground. 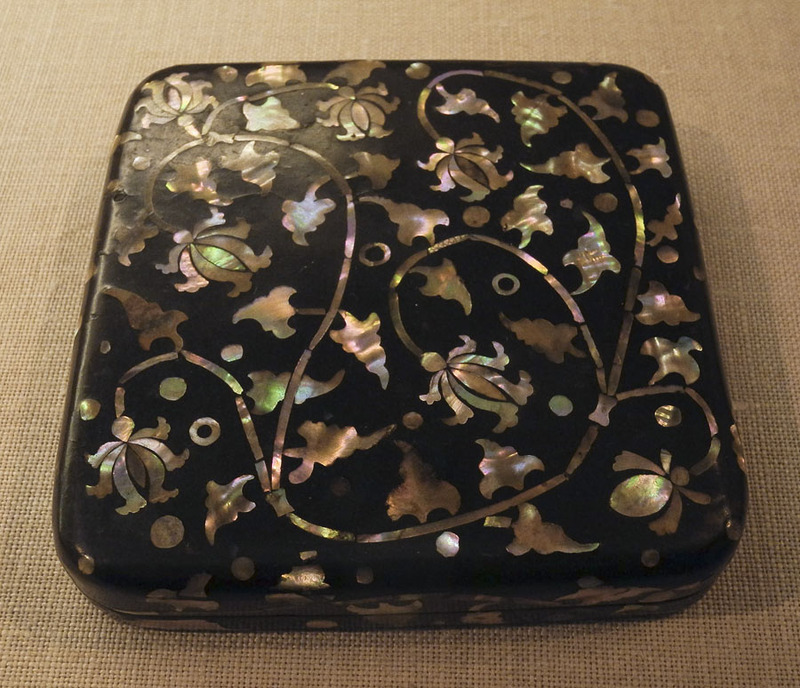 I love this little box, made with the maki technique of sprinkling gold powder on lacquer; here there is also a mother-of-pearl inlay. It makes a light-filled object, delicate and poetic. 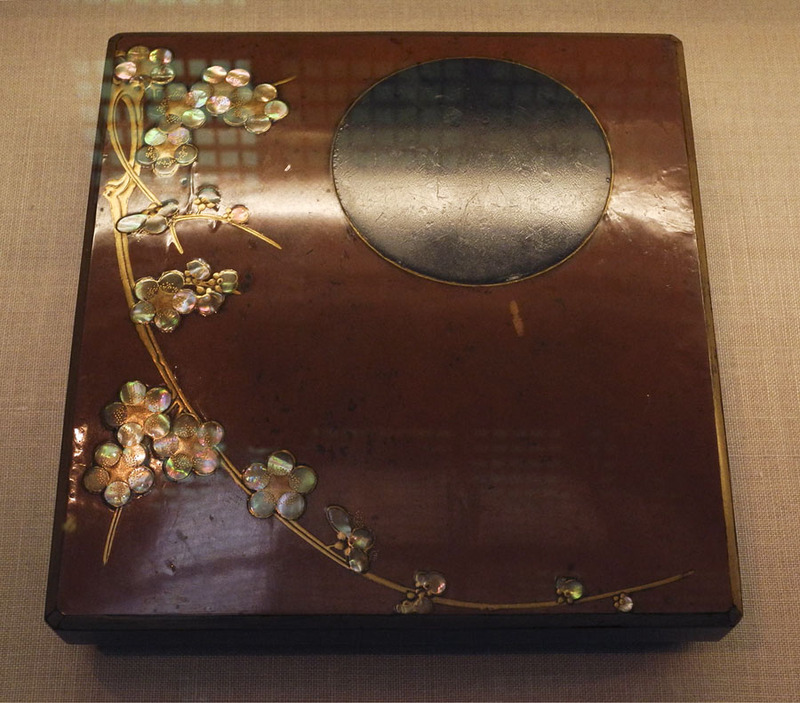 Writing Box with Plum Blossoms and Moon, Japan, 18th century; reddish-brown lacquer with gold hiramaki-e, lead, and mother-of-pearl inlay. 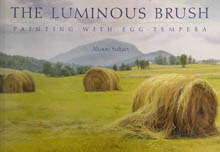 This, and the next few pieces, use a combination of techniques, used to best express the character of the image. 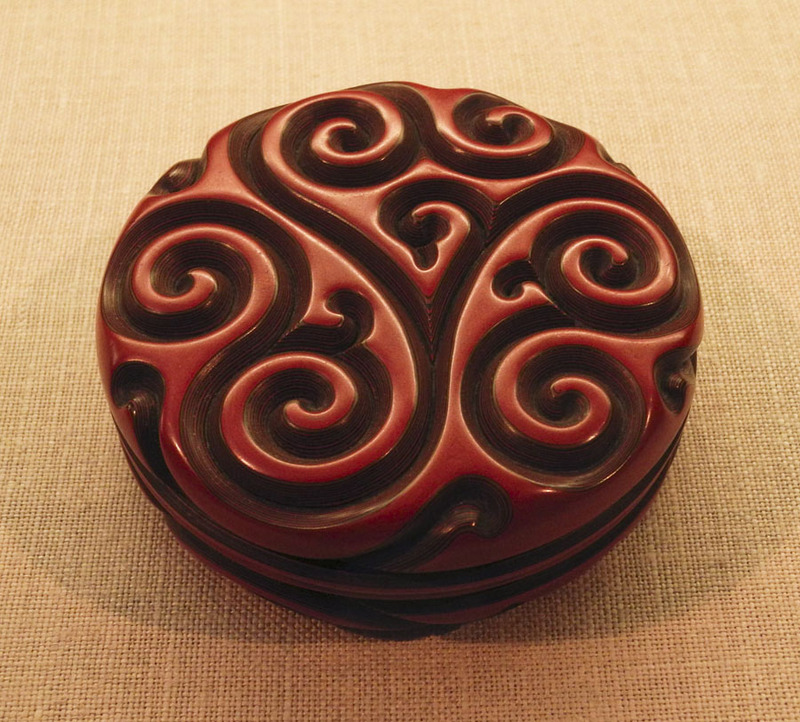 The simplicity of design of this writing box, with its dark circle for a moon and its curved branch of blossoms, reminds me of the Rinpa aesthetic, in which nature is described with sensitivity and is balanced with emptiness. Writing Box with Poet Kakinomoto Hitomaro, Japan, 17th-18th century; black lacquer with gold and silver takamaki-e, hirmaki-e, cutout gold and silver foil application, and lead rim. 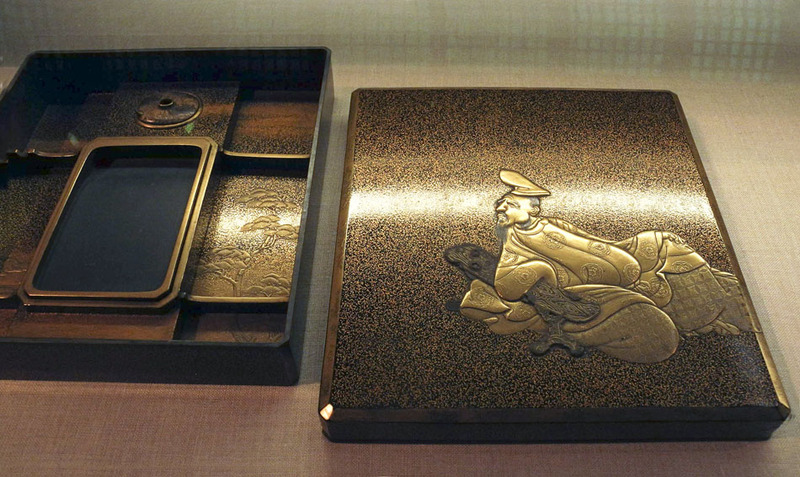 Stationery Box with Moon and Autumn Grasses, Japan, 18th century; black lacquer with powdered and sprinkled gold and silver hiramaki-e and silver foil application. The delicacy of the imagery on this box is full of longing and memory. 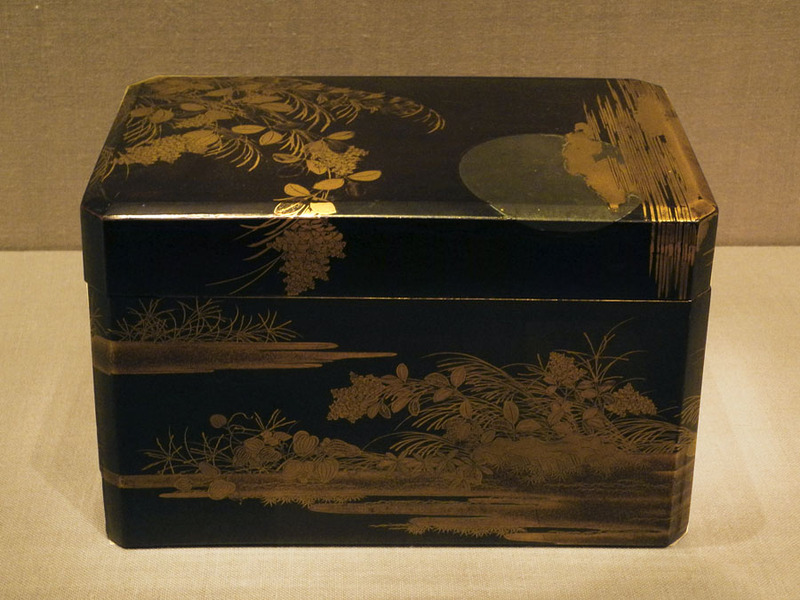 Box with Crabs and Waves, Japan, 17th century; black lacquer with gold maki-e.
A much bolder design displays a different sensibility, but each, the grasses and the crabs, are assuredly elegant and ask for quiet and prolonged looking. Wouldn't it be wonderful to be able to be intimate with any of these works? 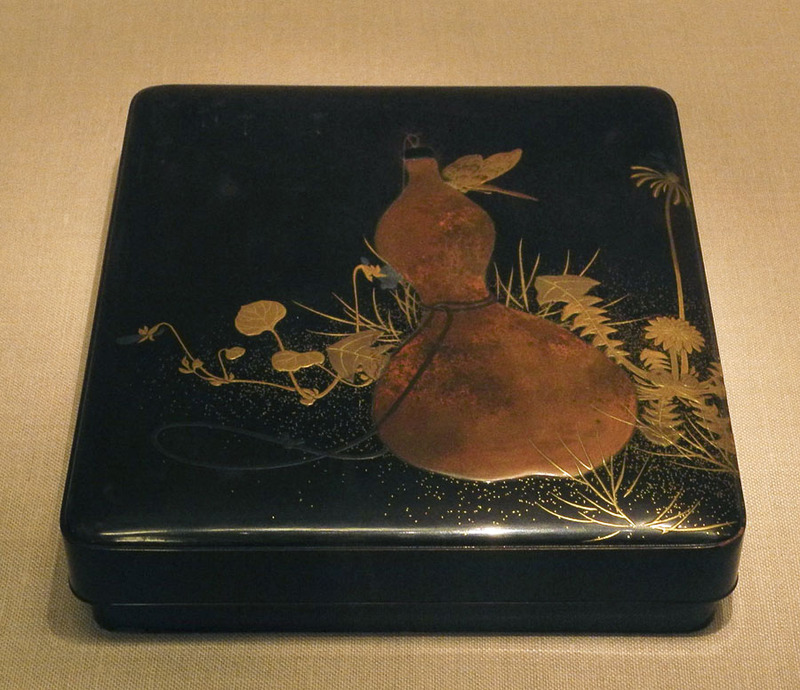 School of Shibata Zenshin (1807-1891), Writing Box with Gourd, Japan, 1886; black lacquer with gold and silver hiramaki-e, colored lacquer application. This final piece is dated and the maker is known. It is just as beautiful as more ancient works, just as sensitive to nature and to the composition on a surface, and the drama of gold or color on a black ground. In Japan the gourd is associated with spring, so the inclusion of dandelions is a seasonal expression. The jagged leaves and many-petaled head of this common flower is so carefully observed that it becomes as valued as a rare plant, a transformation of life into art. Untitled 64, ink and pasted paper on Akatosashi paper, 14 x 10 in. As is my wont, seeing an art exhibition has inspired new ideas for my work, in this case the marvelous show at MoMA, Henri Matisse: The Cut-Outs. 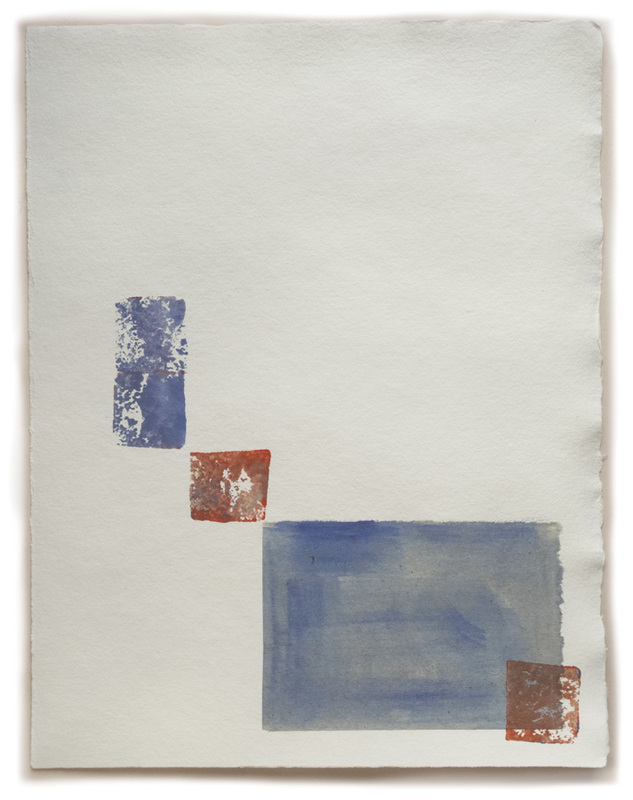 I began by painting some paper shapes, using my Japanese printmaking papers; then I glued them to sheets of paper, taking some time to figure out a placement that would have some energy. Once the papers were dry, I added ink using potato stamps, as with my previous potato prints. In the print above, the yellow-orange rectangle is pasted paper, and the thick red line is printed. Because I used thin Japanese papers, there is a lot of wrinkling and shrinking from the pasting process. Untitled 65, ink and pasted paper on Twinrocker paper, 7 x 15 1/4 in. Untitled 66, ink and pasted paper on Twinrocker paper, 14 x 10 3/4 in. When I used a heavy weight handmade paper, such as the Twinrocker above, there was no wrinkling. 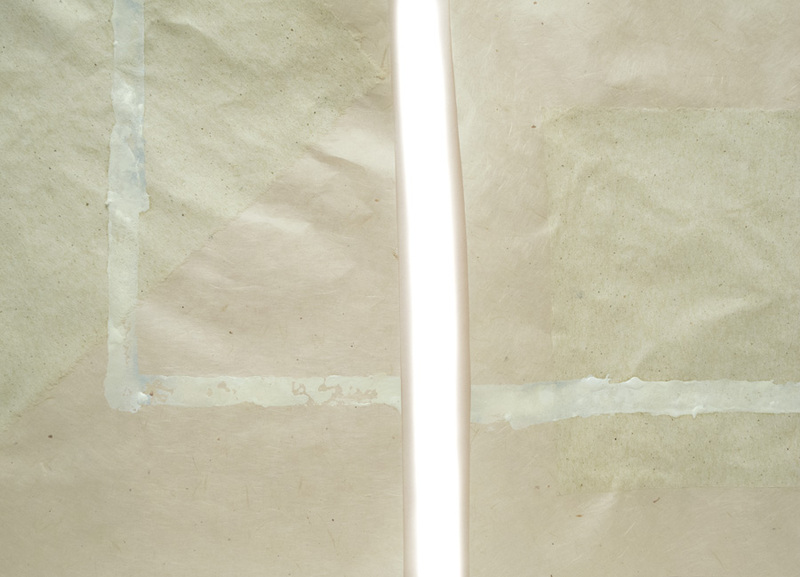 But it's odd, I prefer using the more delicate papers for this work; there's something about the vulnerability of the thin paper that is very attractive to me. Untitled 67, ink and pasted paper on Akatosashi paper, 7 1/2 x 13 in. 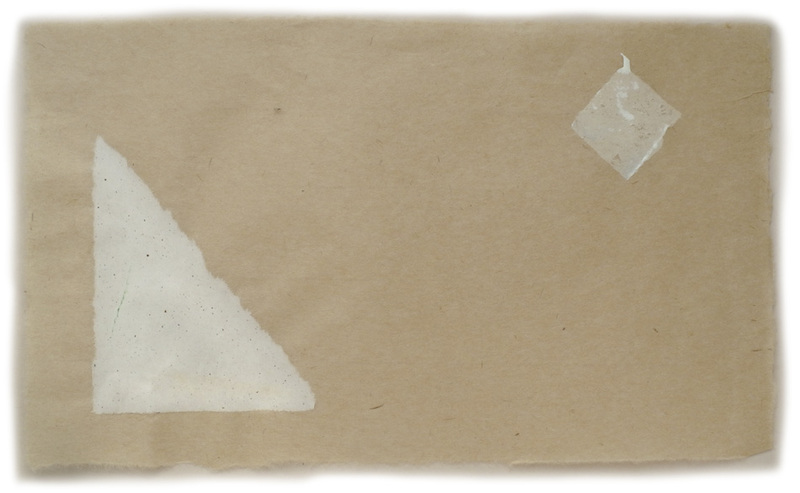 In Untitled 67 I tore a triangle from a piece of Gifu Green Tea Light paper, which is a spotted white. I balanced it with a printed white square. 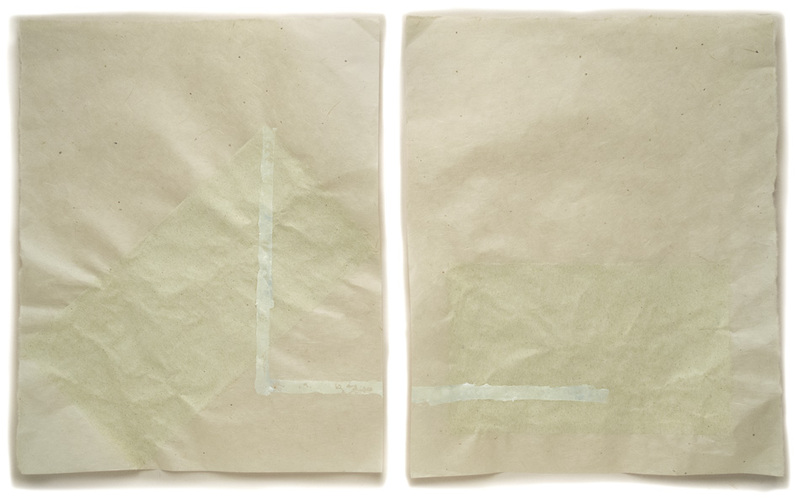 Untitled 68, ink and pasted paper on Gampi Smooth paper; 2 panels, each 15 x 12 in. The pale green rectangles of Gifu Green Tea Medium paper are close in value to the warm-colored ground paper, Gampi Smooth. Because they are both quite thin and a lot of glue (I used wheat paste) was needed for the large pieces of pasted paper, the work is quite wrinkled. I can't decide if it's a distraction or an integral aspect of the process, but I didn't dislike it enough to discard it. I added lines of a pale white slightly tinted with green to unify the composition. 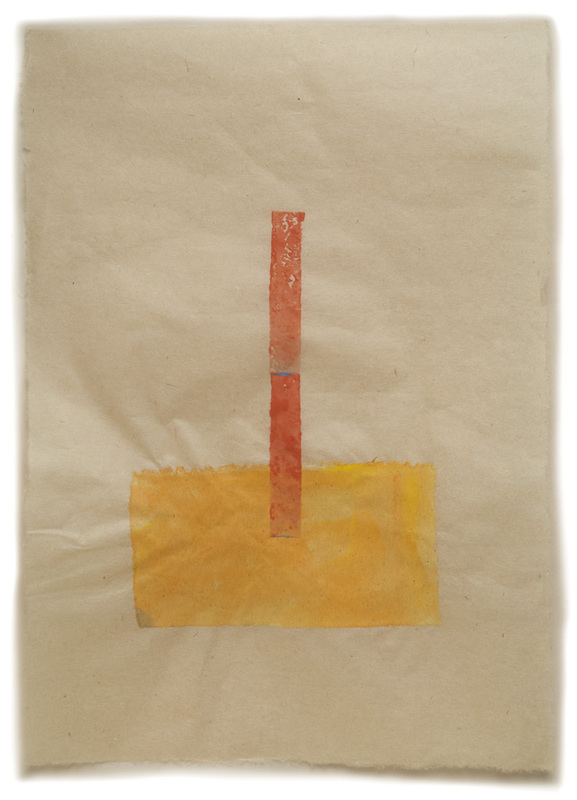 Untitled 69, ink and pasted paper on Nishinouchi paper, 10 1/2 x 20 in. 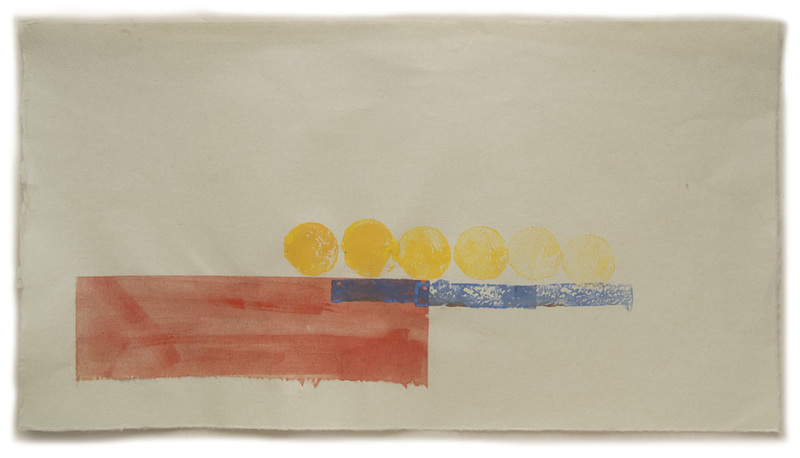 A long red rectangle of pasted paper holds up some fading circles rolling on a blue horizontal. 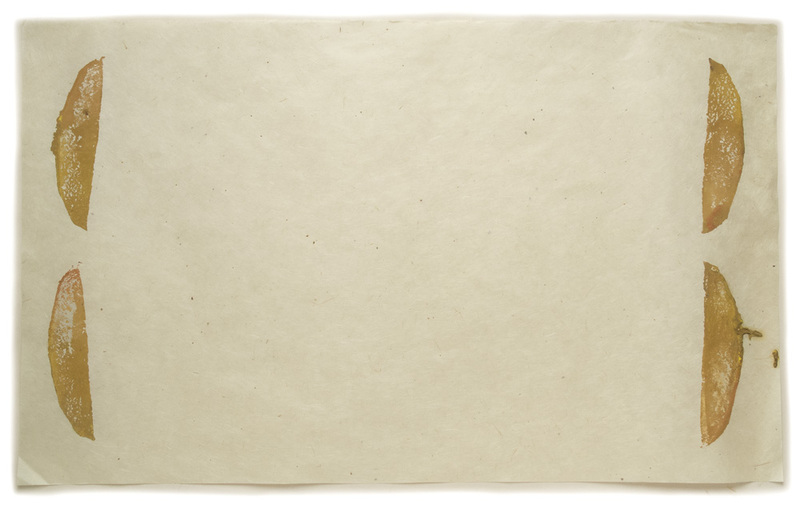 This paper, Nishinouchi, is a heavier handmade paper, so wrinkling is less evident. I am considering using my heavier Japanese papers for my collage/potato print hybrids. Feedback is welcome; you can see the images better if you click to enlarge them. Untitled 70, ink on Gampi Smooth paper, 15 x 25 in. Finally, a print that has no pasted paper on it. I stamped the four shapes, then stopped to think: I had planned to add something in the center, but as I looked at the print, it seemed less and less necessary to me. I'm still not sure that the print has any value, but I'm glad I left the center empty. 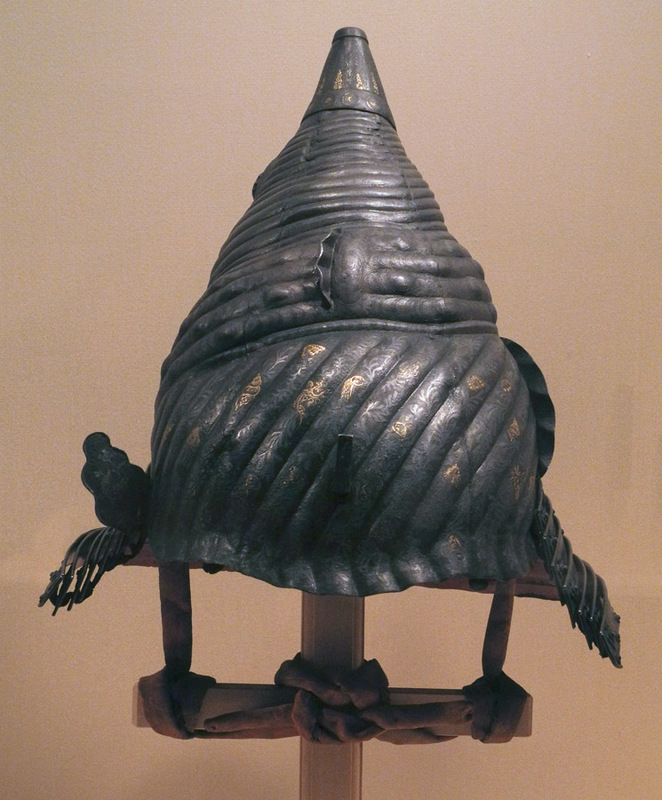 Helmet in the Shape of a Sea Conch, Japan, Edo period, 17th century; iron, with gold and silver inlay. Mastery of the arts of war was by no means sufficient. To achieve and maintain their wealth and position, the samurai also needed political, financial, and cultural acumen. Samurai were patrons of Buddhism, of the arts of painting and theater and calligraphy; some were poets. Knowing this, it is not surprising that a helmet would express such creativity, and such careful observation of a natural object. 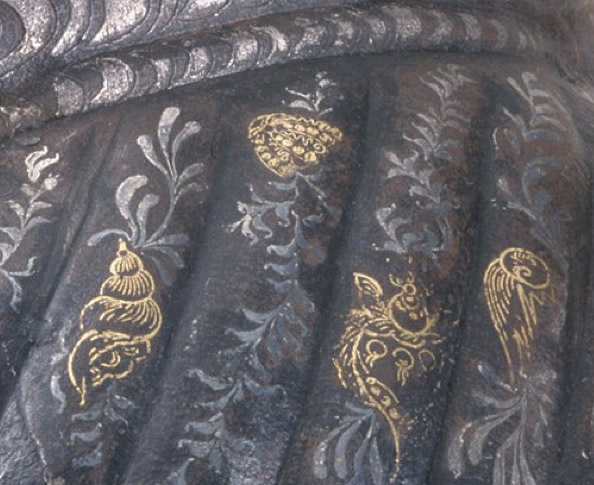 That object, a sea shell, is inlaid with delicate designs in gold and silver, adding a vividness to the gray iron. 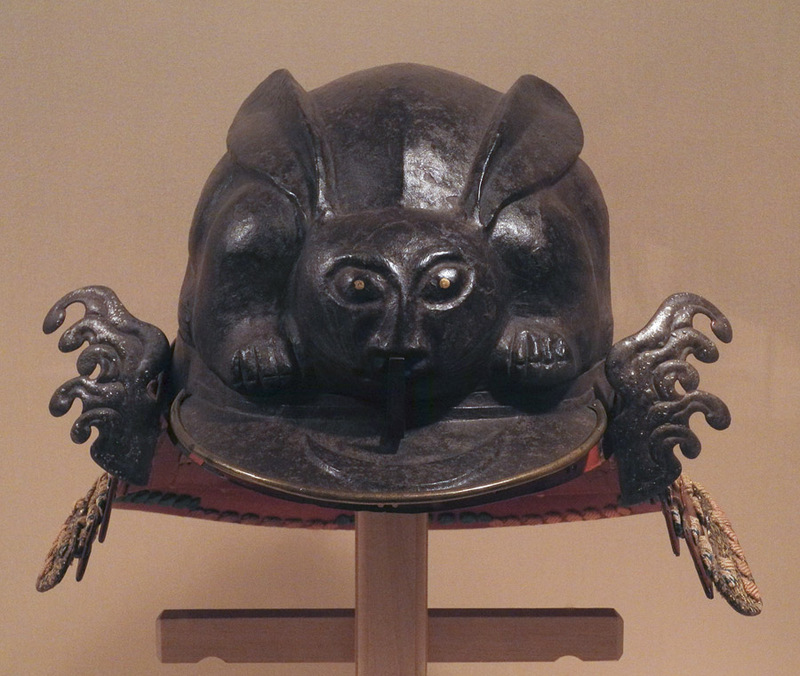 Helmet in the Shape of a Crouching Rabbit, Japan, Edo period, 17th century; lacquered iron, silver, gold, leather, silk. A rabbit crouches amid grasses, looking like it's about to spring forward. This is another surprising image for a warrior's helmet. I wonder if the rabbit is a symbol of the warrior's clan or lord. 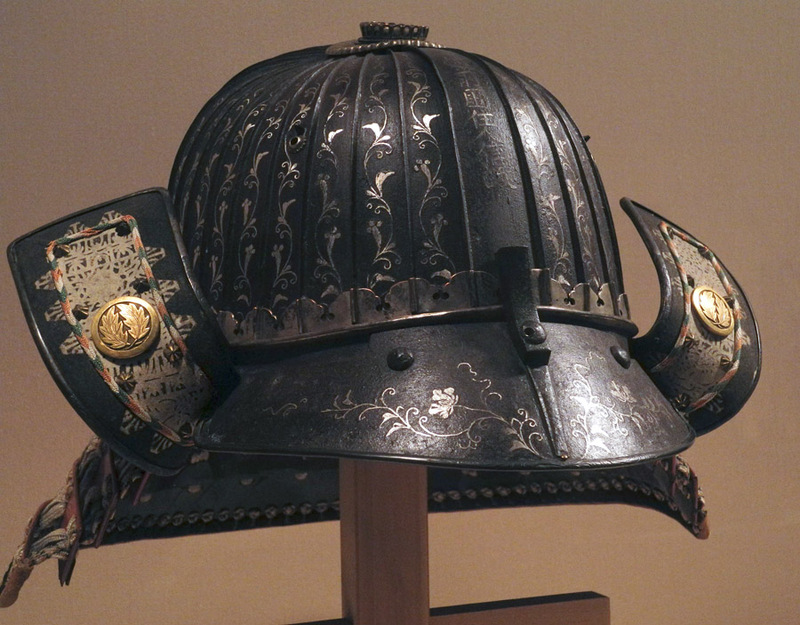 Helmet (Suji Kabuto), inscribed by Yoshihisa and Nobumasa, Japan, Muromachi period, 16th century; iron, silver, stenciled leather, silk. This helmet seems closer to what one would expect in a warring setting, a shape that could even be modern. But then there is the elegant floral silver inlay, making poetry out of iron. Here is another seemingly fanciful decoration: two pine cones with nature's geometry in front of lines of raised rivets, an orderly sculptural expression. lacquered paper maché, copper, silver, gold. This beautiful hat, so clear in line and simple in its decoration, "was worn for traveling or in camp". 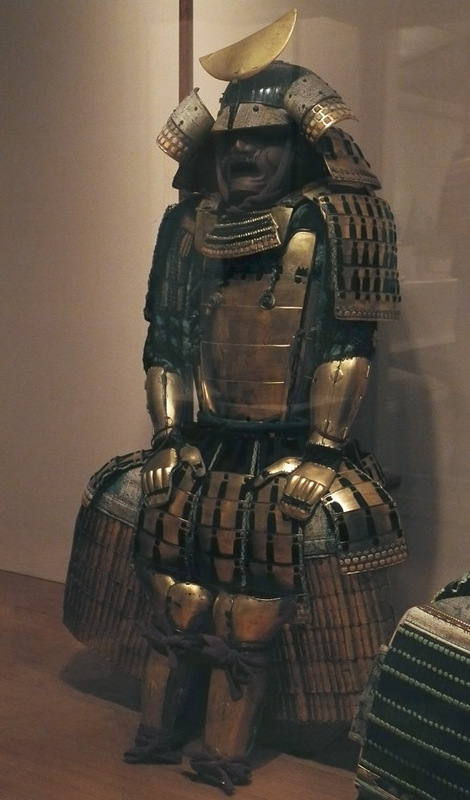 Armor (Gusoku), Japan, Edo period, 17th century; lacquered iron, silk, gilt copper. In the gallery are several full sets of armor, complete with frightening masks. It's interesting to contrast this set of armor with the European, in which the face is totally hidden. The expression of this Japanese mask reminds me of the fearsome faces made by Maori warriors in their war dance. Many of us are aware of samurai culture from the movies, especially those period dramas of the brilliant Kurosawa. 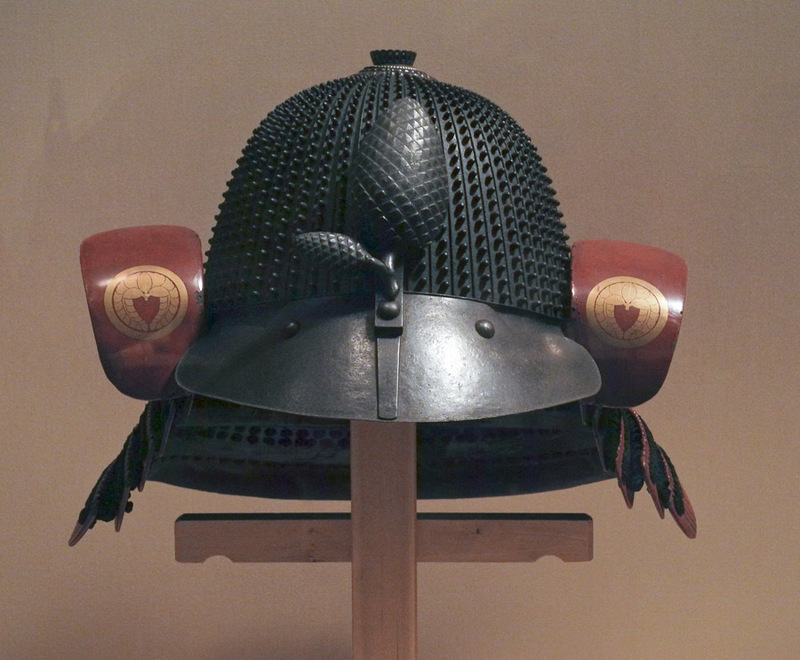 The Japanese armor in display cases in the museum comes to life with the images of his films vividly in mind. 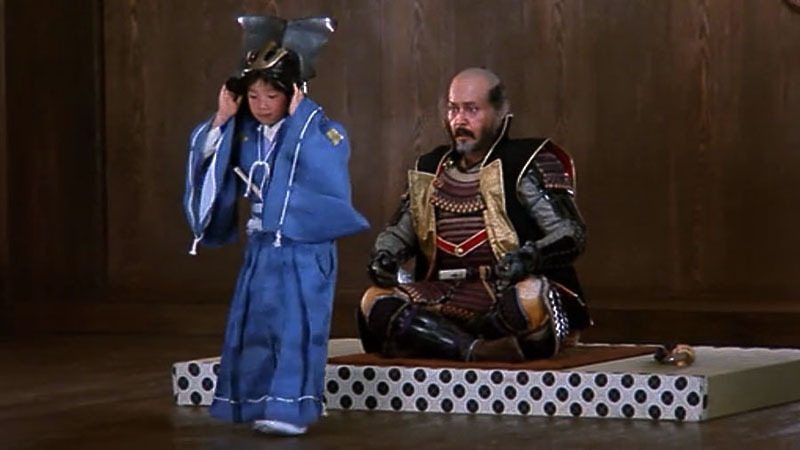 Kagemusha is one of the most powerful anti-war films I have seen, a cry from the heart against human foolishness and stupidity. We can hope to take the beauty and leave the war behind. 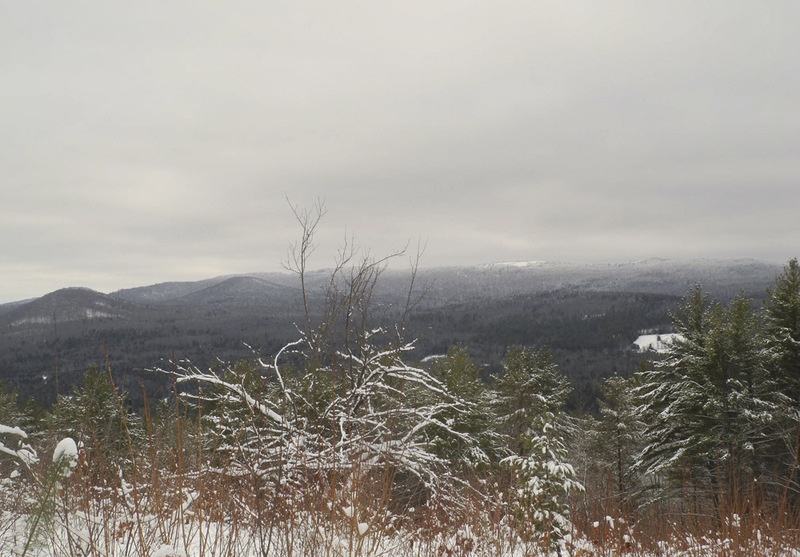 I was feeling rather glum this morning: yet another dark cloudy day in a long string of them, a day forecast for some sun, but a temperature inversion brought gray skies. 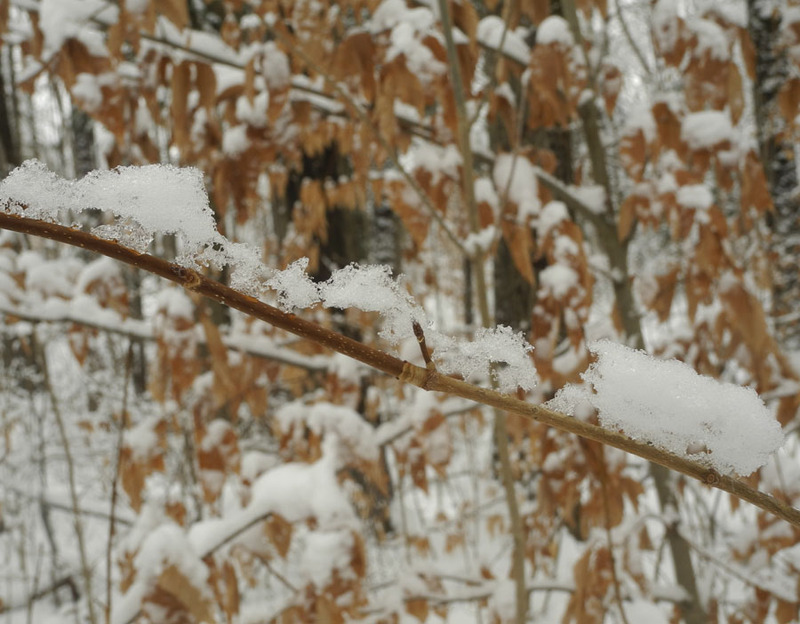 My tendency is to stay indoors feeling sorry for myself, but I gave myself a talking to, put my camera around my neck, strapped on my snow shoes, and went for a long walk in the woods, a sure cure for melancholy. 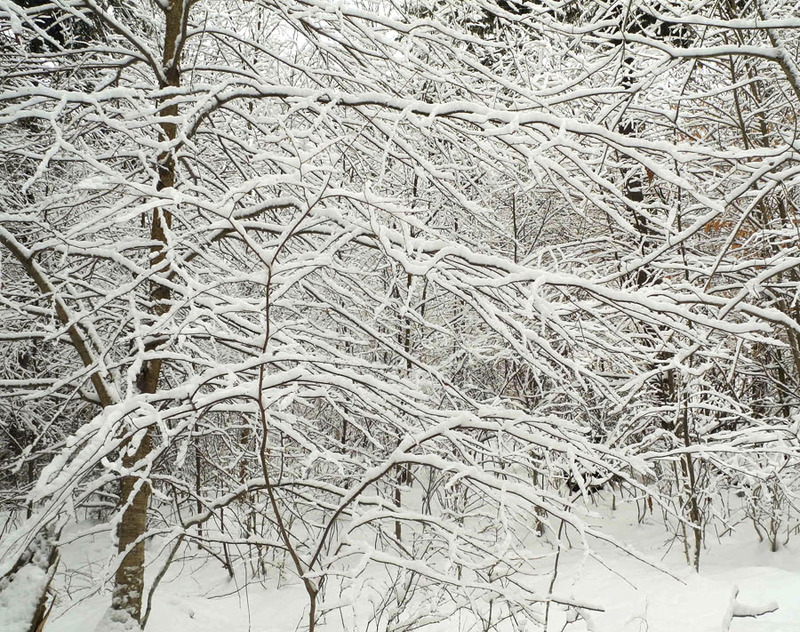 The snows of last week are still clinging to boughs and branches, and make a marvelous landscape crisscrossed with lines of gray-browns and white. I felt as though in another world walking through it. 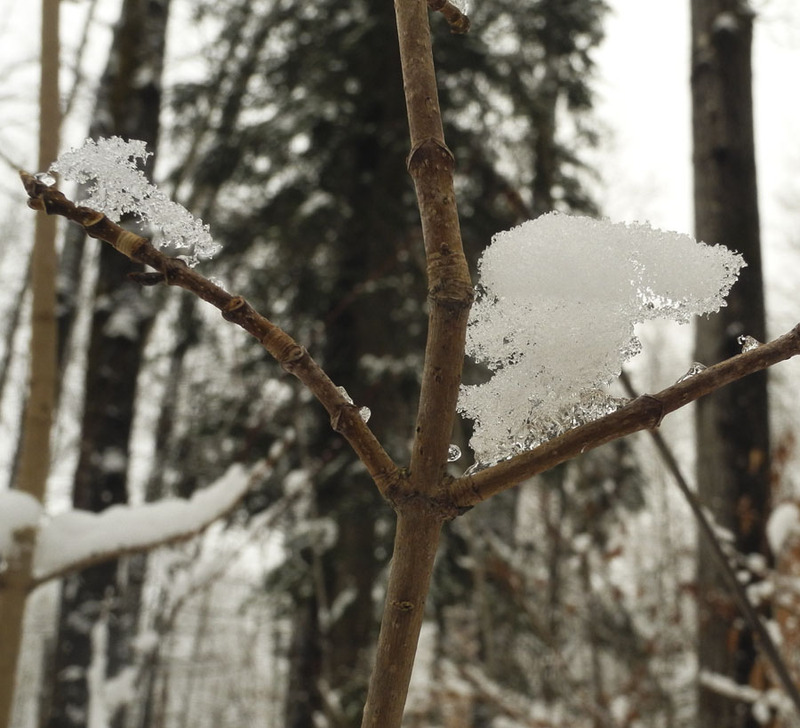 Looking closely, I found magical balancing acts, with dancing shapes of icy snow on top of small branches. ....or like some mythical creatures glimpsed only briefly. 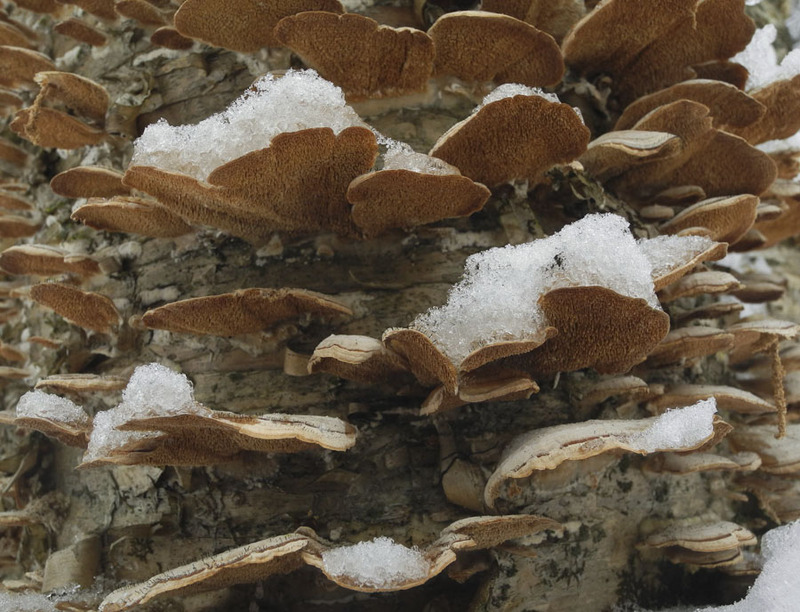 Snow also clung to available surfaces, like those of small shelf mushrooms. 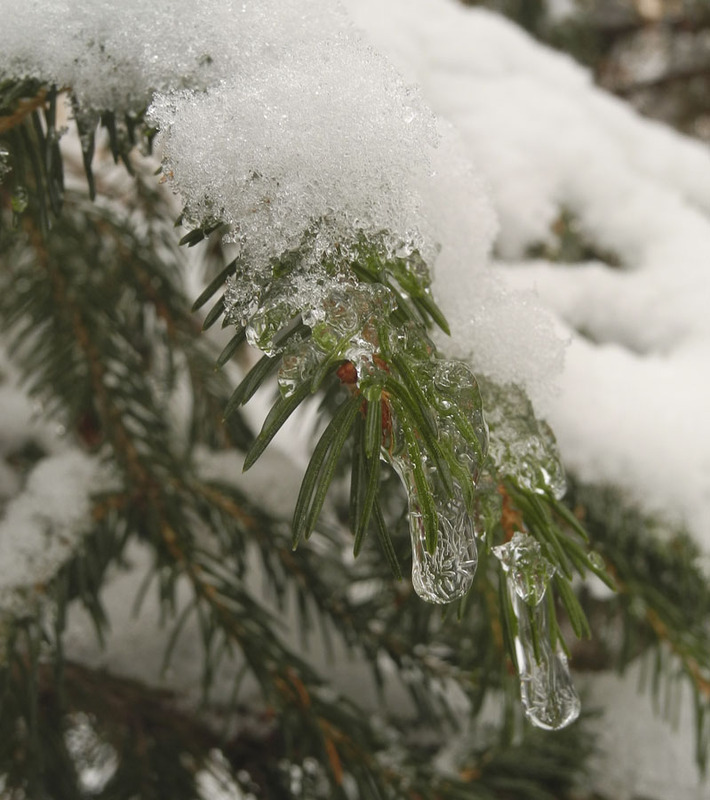 Dangling from the ends of evergreens, clear icy crystals, natural baubles for the season. 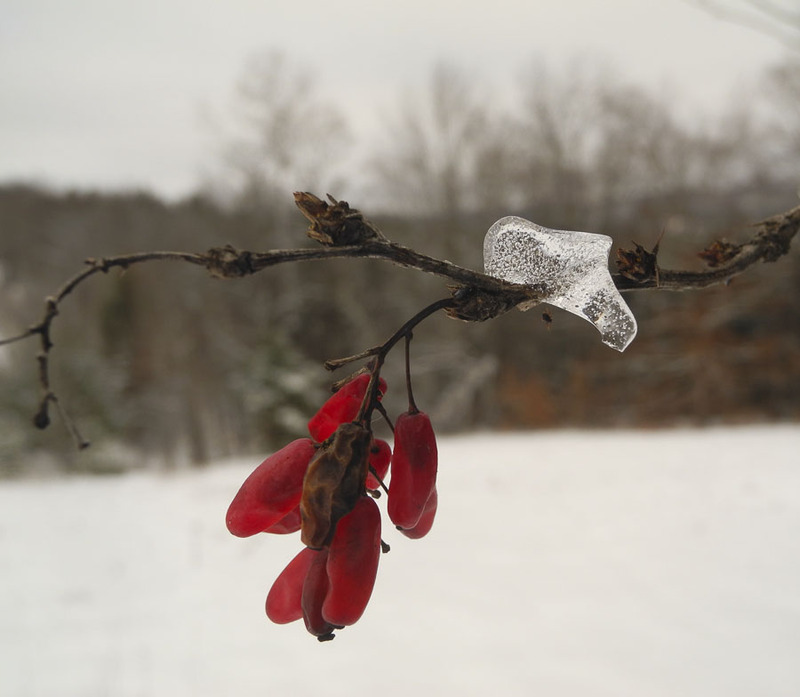 Another ice decoration clung to a small branch, competing in loveliness with the bright dried berries. 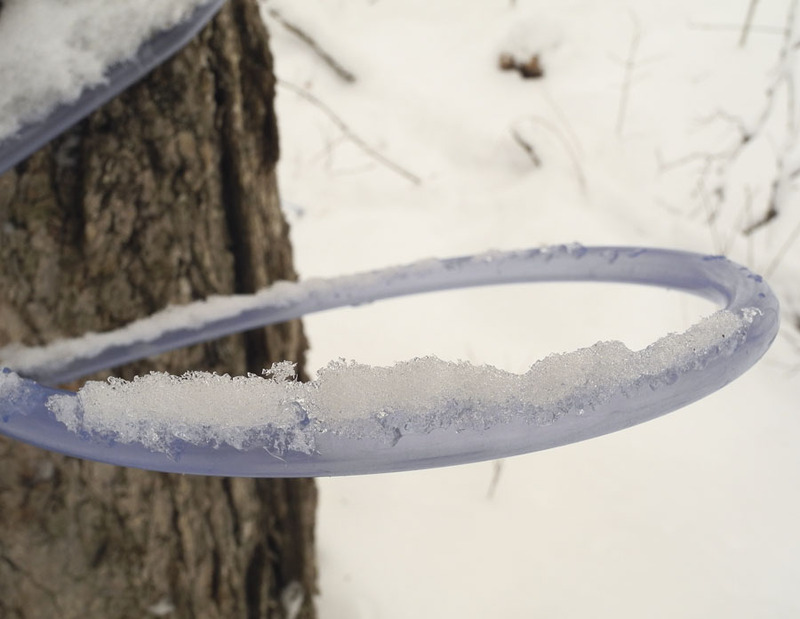 The snow even looked beautiful balanced atop a round of pale blue plastic, maple sugar tubing. 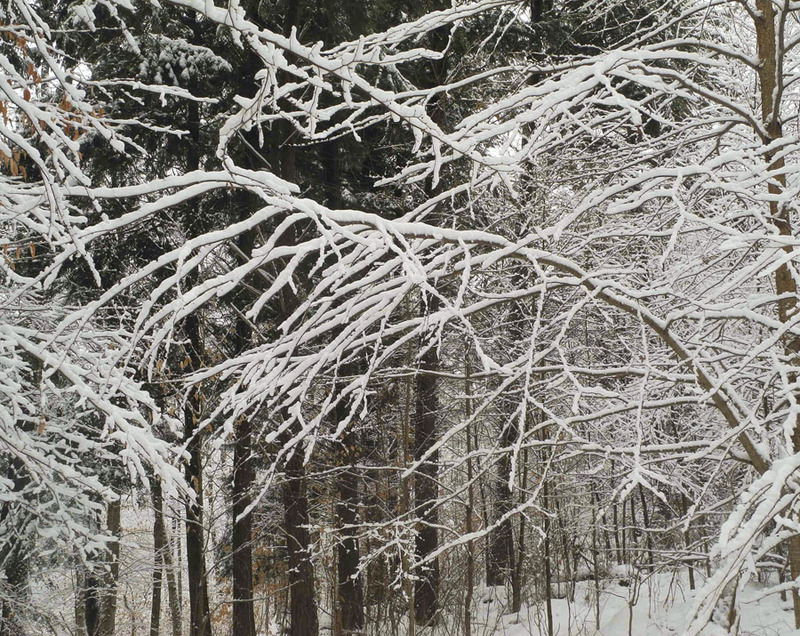 Stepping out of the woods to an open view, I saw the branches of a tree highlighted in white; they seemed to move and flow like the arms of a many-limbed goddess. 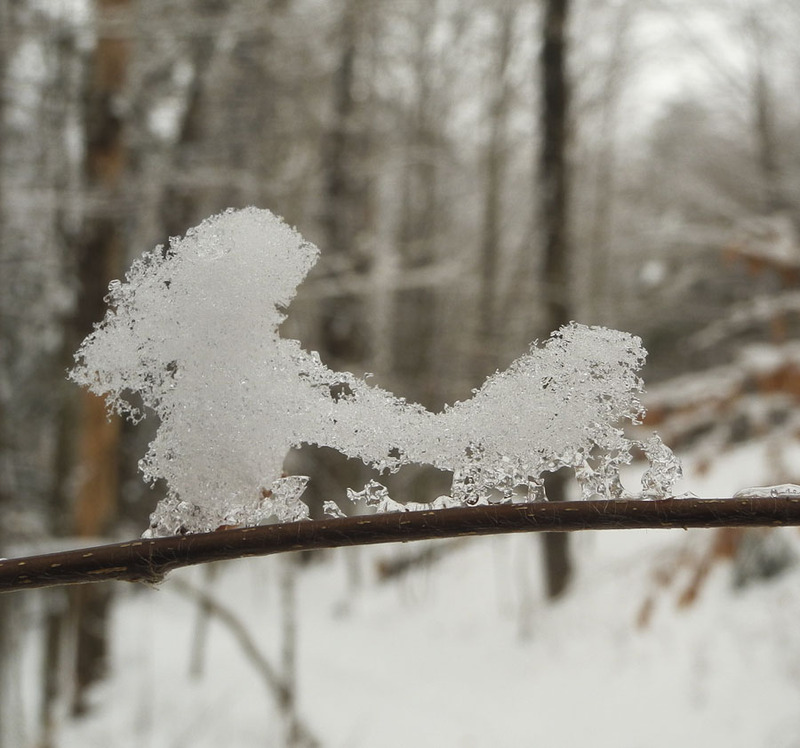 Whether looking near or far, the act of looking itself, of paying attention to the world of nature, balances my life: gazing outward, not focused on the self; away from the art world, away from the computer, I take a deep breath of beauty. I have been reading a biography of the philosopher and psychologist William James, In the Maelstrom of American Modernism, by Robert Richardson. It has brought back to mind some essays of James, a humanist thinker whose ideas on the multiplicity of life, and the primacy of experience, are very attractive to me. I have written about his essays: the brilliant one on "Habit"; on "The Gospel of Relaxation", comparing it to Buddhist thought. And I've written on his great short essay "On a Certain Blindness in Human Beings". I am for the first time republishing a blog post, one that I wrote two years ago, just before Christmas, soon after the school shooting at Sandy Hook. It seems to me that we need James's wisdom yet again after the recent police shootings, his admonishment that we can't know what is in another heart. This understanding would go a long way to allaying prejudices; if we all could accept this, would racism still exist? "Take our dogs and ourselves, connected as we are by a tie more intimate than most ties in this world; and yet, outside of that tie of friendly fondness, how insensible, each of us, to all that makes life significant for the other!––we to the rapture of bones under hedges...they to the delights of literature and art. As you sit reading the most moving romance you ever fell upon, what sort of a judge in your fox-terrier of your behavior? With all his good will towards you, the nature of your conduct is absolutely excluded from his comprehension. 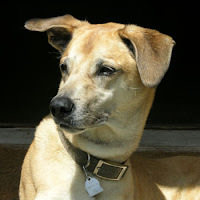 To sit there like a senseless statue, when you might be taking him to walk and throwing sticks for him to catch! What queer disease comes over you every day, of holding things and staring at them like that for hours together, paralyzed of motion and vacant of all conscious life?" A New Textile: "Translucent Curves"
At the Met: "Ragamala: Picturing Sound"